Beautiful and spacious 2 level villa is a great place to spend unforgettable holidays with your family! Cozy living room with flat screen TV, beautiful dining area, comfortable kitchen with lovely breakfast area-all this features make this house so lovely and inviting. Every bedroom is tastefully decorated and has TV to make your vacation even better. Home has lovely private pool, with screened lanai and outdoor furniture to enjoy beautiful weather outside. Villa is located in the Calabay Parc Community.Calabay part is a vacation rental community just minutes from some of the best shopping, popular restaurant. 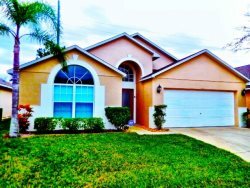 Located only 15 minutes away from Disney Parcs and main attractions! We are also surrounded by some of florida's finest golf courses!